Kumbalangi (or Kumbalangy) is a culturally-rich, visually stunning quaint island village in Kerala where one can experience the peaceful village life to the hilt. 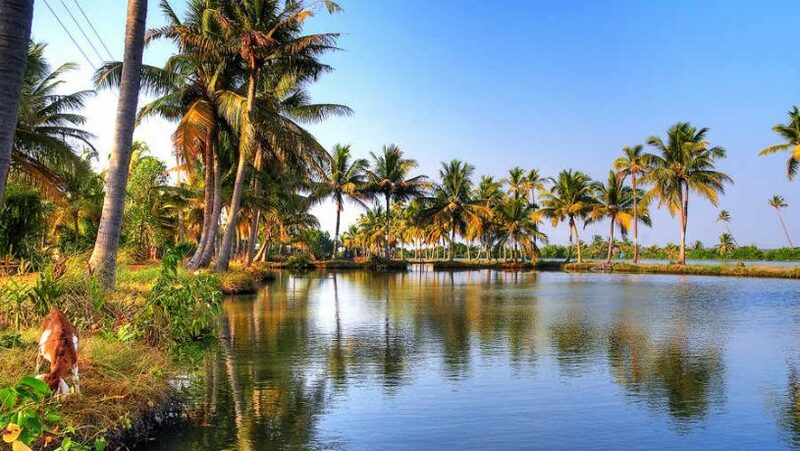 Located 12km south of Kochi, Kerala in the Ernakulam district, Kumbalangi is a stunning confluence of vivid colors – the azure backwaters, the viridian palm trees, the wheat-colored sand, and a cloudless, brilliant blue sky. Although the village is essentially a fishing hamlet, it also happens to be Kerala’s first rural tourism village and the country’s first designated eco-tourism village. The initiative is known as the Kumbalangi Integrated Tourism Village project, which began in 2003, and is meant to transform the tiny island hamlet into a tourist spot and a model fishing village. An interesting legacy of Kumbalangi is the presence of the Chinese fishing nets that dot the serene, sun-kissed coasts of Kumbalangi. Although the origins and existence of this mode of fishing in Kerala are unclear, these unique, massive hammock-shaped mechanically operated fishing nets have become a popular fixture in the island village. The Kumbalangi Integrated Tourism Project is being implemented by the Panchayat (village council) with financial backing and support from the state government. Ever since the project has begun, the village infrastructure has been revamped up to make it tourism-worthy, including the setting up of a waste management system. Kumbalangi is extremely humid and hot during the summers with the mercury reaching 34 degrees Celsius. June to mid-October are the monsoons when the temperatures hover around 23 to 30 degrees Celsius. Winter temperatures range from 22-30 degrees Celsius. So, the best time for a road trip is between August and March when one can enjoy the effects of the monsoon or experience winters in Kerala. The nearest airport to Kumbalangi is Cochin International Airport which is located around 45 km away. 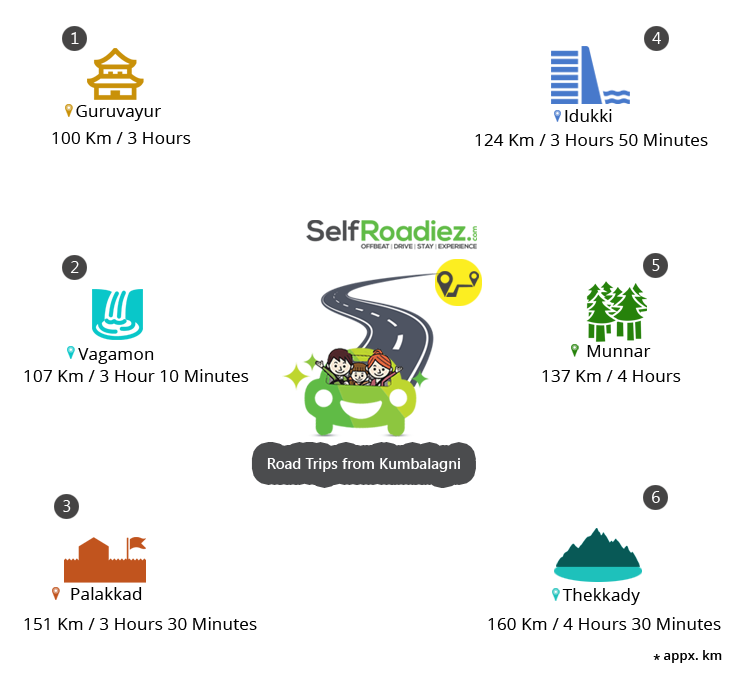 The nearest major railway station is at Ernakulam around 20km away from Kumbalangi. Aroor railway station lies just outside Kumbalangi where many passenger trains stop as well. Travelers can drive down to Guruvayur which, according to legends, may be as old as 5,000 years old. The town is famous for the Shree Krishna Temple, India’s fourth largest in terms of a number of devotees, and is a popular pilgrimage site. The temple is famous for a 7 meter-high Deepastambham with 13 circular containers and a 33 meter-tall gold-plated Dwajastambham. Travelers can also visit the Punnathurkotta elephant sanctuary where elephants have been worshiped for years. One should travel southeast to the sleepy hill station of Vagamon, also known as the Scotland of Asia, located in the Idukki district. Nestled against three hills, the rolling, undulating verdant meadows of Vagamon are still untouched by commercialization and are the ideal place to retreat to for a laid back chilled out vacation. Places to visit include the Vagamon Meadows which have a lake amidst them, the pine forests of Vagamon, the Kurisumala, and Mitraniketan ashrams, and the Mooppanpara and Murugan summits for gorgeous views of the valley. If one visits Vagamon in the months of September-January or March-May, they can also indulge in the thrilling sport of paragliding. The scenic hill station of Idukki located in the Idukki district north of Kumbalangi and overlooks the Idukki gorge wherein flows the Periyar River. Formerly part of the Chera dynasty and later ruled by the Kulasekhara kings, Idukki derives its name from the Malayalam word ‘Idukku’ meaning a ‘narrow gorge’. Idukki also houses Asia’s largest arch dam, the Idukki dam, and offers a range of diverse attractions including mountain treks, spice plantations, waterfalls and lakes, and wildlife sanctuaries. A thousand shades of verdure greet travelers at Munnar, which is located in the rolling hills housing South India’s largest tea-growing regions. Located in the Idukki district, Munnar sits at the confluence of three rivers Kundaly, Nallathanni, and Mudhirapuzha. The hill station is a haven for adventure-hungry travelers and culture enthusiasts and attractions include trekking trips, hikes through the dense jungles, glimpsing endangered wildlife in Eravikulam National Park and paragliding. One can also visit the many tea plantations and the century-old renowned Christ Church, which is adorned with stained glass. The lush-green town and region of Palakkad in Kerala is known to be the state’s ‘Rice Bowl’ due to the number of rice and paddy fields in the region. It is also famous for the Palakkad Gap between the Anaimalai and Nilgiri Ranges. Places to see in Palakkad include the Malampuzha Dam and Gardens, the Rock Garden, the stunning Seethargundu viewpoint, Tipu Sultan’s and Palakkad Fort, the Parambikulam Wildlife Sanctuary and the Kalpathy heritage temple complex. Sitting on the edge of the Periyar Wildlife Sanctuary, Thekkady is all about spices, greenery, and wildlife. The thick cover of the Periyar Wildlife Sanctuary extends to Thekkady, which is the quaint hamlet’s main attraction. One can indulge in a Spice Walk amongst the spice plantations, go trekking and hiking in the wildlife reserve, ride a safari and spot some amazing species of flora and fauna, pay a visit to the many temples in the region or check out the gorgeous views from the many viewpoints in Thekkady. The culture-rich Kumbalangi has more to it than just fishing. One can watch the womenfolk of the village weave golden fiber-coir and coconut leaves and witness the fishermen indulge in crab farming and clam processing. Travelers can soak in the sun by cruise the backwaters of rice boats or country boats or engage in indigenous fishing. Since Kumbalangi is a beach destination, there are luxurious hotels and resorts on the banks of the waters and cozy homestays for travelers. This Traditional Homestay near Neduveli, a three-acre plantation, has two accommodations—Backwater Cottage and Garden Room which can each accommodate four persons. The former is a large room while the latter is actually two rooms that can be combined if required. Backwater Cottage is independent of the main house and is ideal for those desirous of private space. The spacious room with a verandah has twin beds and provides a beautiful view of the backwaters. Travelers should slow down and enjoy in Kumbalangi rather than simply making a day trip out of it. They should take a walk along the shores and talk to the locals which will give them a wonderful and detailed insight into how they live their lives. In the end, Kumbalangi is an escape from the mundaneness of regular life. One should stay in one of the houseboats or the many converted homestays, gorge on delectable dishes of Kerala and boast about having lived the village life.